Home • Cuban Missile CrisisCuban Missile Crisis | Harvard Kennedy School’s Belfer Center has created this site as a resource for the Cuban Missile Crisis. 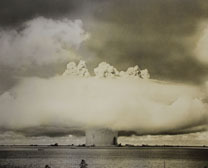 Designed to help policymakers, students, and interested citizens draw lessons from these critical events half a century ago, this site not only provides background on the crisis that brought the world to the brink of nuclear disaster in October 1962 but also offers tools to understand how it can inform contemporary policy. The Belfer Center has launched its first iTunes U course, "Cuban Missile Crisis: 50 Years Later," which is available for Apple iPads and iPhones. Download our tools for middle school, high school, and college teachers to engage students in thinking about this decisive chapter in American and world history. The Belfer Center and Foreign Policy Magazine are delighted to announce the winning entries of the Lessons of the Cuban Missile Crisis contest. Get a list of the winners and runners-up here. 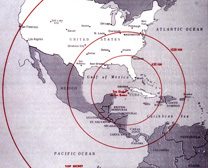 Belfer Center for Science and International Affairs has created this website as a resource on the Cuban Missile Crisis of October 1962. Designed to help policymakers, students, and interested citizens draw lessons from these critical events half a century ago, this site not only provides background on the crisis, but also offers tools to understand how it can inform contemporary policy. What are the most important lessons of the Cuban Missile Crisis? Read lessons drawn by presidents and statesmen, and submit your own. Interested in teaching your students about the Cuban Missile Crisis? Click here for reading lists, case-studies and lesson plans. 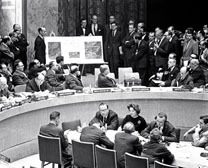 Fifty years ago, the Cuban Missile Crisis brought the world to the brink of nuclear disaster. What are the greatest nuclear threats we face today?